Beginners and experienced artists welcome! Whether you are a complete beginner or an experienced artist wanting to sharpen your drawing skills, these classes offer a relaxed yet focused environment for all. Depending on the individual, tuition ranges from simple suggestions to discussions on line, tone, shading, composition etc. If you are an experienced artist, you can be left in peace to draw to your hearts content! Each week there is a focus which students may want to take part in. We take inspiration from a specific artist or style - materials, composition, colours or subject matter will be discussed and be used to inspire everyone. We have had some unusual themes over the years including belly dancers, drawing with biros and on newspaper, continuous model movement, human and dog posing together and much more! ​Every few weeks there will also be a long pose session when the model will hold just one pose for the entire evening. This is a great opportunity to dig out the paints! During the session we generally start with some shorter poses as a warm up (2 minutes and 5 minutes) before moving onto longer poses (20 and 30 minute). We have a tea break half way through - tea, coffee and biscuits are all provided. The contact information given to Harri-art is for the sole use of updating you about classes and courses running in Maidenhead and Berkshire. 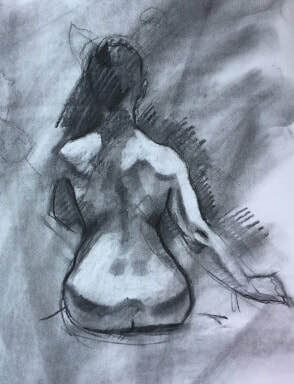 For the regular life drawing classes generally two emails are sent per week each one relating to a specific life drawing session. The one-off class emails are sent on average, one per quarter although in some circumstances maybe be one or two more. Your names and email addresses are not, and will never be, passed on to anyone else and are stored safely on a password protected computer. ​The session runs from 7:00-9:30pm. ​ we can start on time. The sessions run throughout the year including half terms and summer holidays, but not over the Christmas season (generally we break from mid December to mid January). Now and again a session won't run, but I will let you know via the email subscription and this website. Life drawing classes take place in White Waltham Parish Hall (on the left hand side if you are coming from Maidenhead/thicket roundabout). The car park is a decent sized and on the opposite side of the road (same side as the school and garage). The entrance is slightly hidden until you are right next to it so look out for a big green salt bin (and if you are coming from Maidenhead/airfield direction the entrance is soon after the very tall dark hedge on the right). The postcode (SL6 3SG) isn't very accurate in google. Some people prefer to head towards "Innings Lane, White Waltham, Maidenhead" which is a small road approx 200 feet further down the road. A pencil or willow charcoal and a few sheets of paper will suffice for the first time. Keep it simple for your first session, then I suggest trying out new materials gradually as you gain confidence. I provide drawing boards to borrow and good quality A2 drawing paper is available for 20p a sheet. I generally have a few materials such as runners, clips and willow charcoal available for people to borrow. Easels are not provided (most people use a chair to prop the drawing board against) however you are more than welcome to bring your own easel.